"The Syncrude oil sands plant, north of Fort McMurray in Alberta, Canada. Since the end of World War ll, oil has made Alberta wealthy. 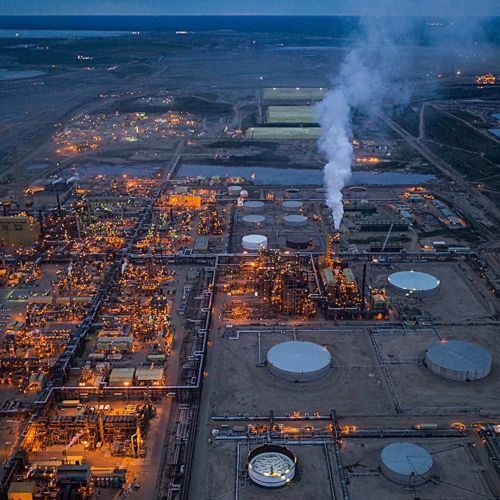 The increase in oil sands development since the early 2000s intensified the province's good fortune and turned obscure Fort McMurray into a boomtown and an outsize contributor to the Canadian economy. But today, the industry is in a state of financial stasis. Oil prices have fallen precipitously, and environmental concerns and political opposition have hampered pipeline plans that would create new export markets. In a province and a country dependent on the energy business, the outlook is hazy. @ianwillms took this #aerial photo while on #nytassignment in Fort McMurray, Alberta." By nytimes on Instagram.